The problem: you have several POP3 accounts and want to combine them into one mailbox and have the email accessible on your smartphone and other computers. The solution: Use Gmail to collect the email from your accounts. This works great, as long as you use the Gmail web interface as you can configure Gmail to reply from the address the message was sent to. If you want to download the mail into Outlook, Outlook is going to reply using the gmail address, because it replies using the account that downloaded the message. Fortunately, Gmail lets you send mail using the connected addresses, even when you use Outlook to send the email. You need to have Gmail configured to send using the account in Settings, Accounts and Import. Note: These steps may work with any account that lets you collect mail from other server and send mail using any address. It won’t work with Outlook.com at this time, unless the additional addresses are in Microsoft's domains (outlook.com, Hotmail, MSN, etc). If you want to set a specific account as the default address, enter it in the Account Settings dialog. Replace the name and email address at the top of the dialog with the address you want to have set as default. If you use one of your addresses here, you won't need to add the address to the macros. To send using one of the other accounts Gmail is collecting mail from, you can select the From > Other Email Address command and type the address in the Send From Other Email Address dialog. The message header will contain the gmail address, but it won’t be exposed in Outlook. In Gmail, go to Settings, then Accounts and Import and Add your accounts to the Send mail from section. 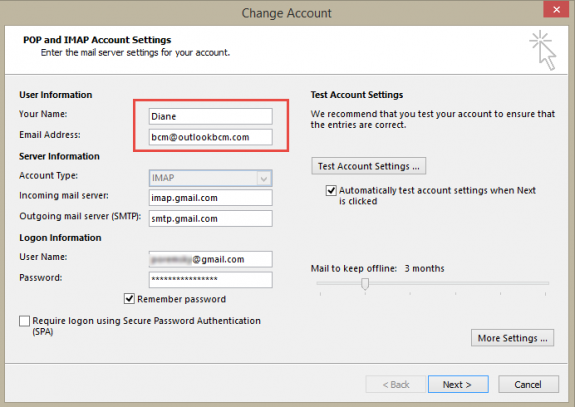 In Outlook, use auto account setup to add the Gmail account to your profile. If your POP3 accounts are in your profile (and also configured as an account you can send from in Gmail), you can remove them from Outlook's Email tab in File, Account Settings. Click From and select Other Email Address. Note: If you previously used the address, it’s listed in the section above Other Email Address. Select it and return to the message form. Type your POP3 address in the Send From Other Address dialog then click OK to return to the message form. The selected address is listed next to the From field. As easy as that is to do, you can use a macro to automate the process. You can also use a macro to open a new message using a specific address and to check the address on outgoing messages. This will not work with Outlook 2013's "inline replies". Replies and Forwards will be opened in a new Window. The following code checks for your specified email addresses in the To/CC field. If it finds one of your addresses, it inserts it in the From field of the reply, the same as if you had used From > Other Email Address field and typed the address in the Send From Other Email Address dialog. If one of your addresses is not on the recipient list, the reply will be from the default address. This macro works with Gmail accounts. It does not work with Outlook.com accounts at this time. This set of macros goes into the ThisOutlookSession module. It runs when Outlook starts and watches for the Reply, ReplyAll, and Forward buttons to be clicked. you can kick start it during testing by clicking in the Startup macro then clicking Run. prompt$ = "You sending this from " & strAddress & ". Are you sure you want to send it?" To use this code, right click on Project1 and choose Insert > Module. Paste it in the module and update the addresses. If you need more than 3 addresses, duplicate one of the account subs, then change the sub name to something unique (like your email alias or domain name) and replace the email address. To use, you need to create button on the ribbon for each account sub then click the button when you want to send a new message from a specific account. First: You need to have macro security set to low during testing. The macros will not work otherwise. Some macros need to be in ThisOutlookSession, others go into a module or can be placed in either ThisOutlookSession or a module. The instructions are below. Hi Diane, with the 'New Messages using a specific address' macro, could you suggest some code to have the new message start with a specified mail signature in it? As I only have one account that aggregates all my others I can't assign a signature to each from address from the GUI, so wondering if this might be possible from VBA. You can use this code to change the signature - if the signature name is the email address you're using, it might be easier. If not, you need to set the signature name when you set the From account. Sorry Diane, the website feedback form strips the less than, greater than brackets, so it doesn't quite read as intended. myAddy = "Granny Smith <granny@mobilegranny.com>"
but use the less than, greater than type brackets that email programs understand. Yeah, that is a problem with wordpress. :( For future reference, if you type out the HTML code for it, it will work &lt ; &gt ; without the spaces. I simply have to shout - THANK YOU. This makes me look so much more professional without half my work emails coming from my private address because I forgot to change the from field... For information I am aggregating my accounts through Fastmail. But when using this Macro the email just comes from the email address which makes a subtle difference for recipients when sorting etc. Is it possible to have the Name format? How do you stand that BRIGHT BRIGHT WHITE background in Outlook lol? I feel like my eyes are being raped using the " colorful " theme. I think I found the error. Thanks!